With this being the third instalment in the series Modern Combat 3: Fallen Nation really doesn't underwhelm. It's bigger and better than the two that came before it combined. Your sent out to fight on American soil for America as its been invaded and beginning to be taken over by the three evils of the world, North Korea, Pakistan and Russia which are forming the KPR. You eventually bring the fight off American soil as you travel throughout the campaign which packs 13 missions. The undertone of Call of Duty Modern Warfare running through the title is to be honest slightly ridiculous. But hey it works from the AC 130 adventure to guitar riffs at the end of missions. The campaign took me around 6 hours to complete. Not the longest campaign in the world but it isn't dragged out and each mission is full of action beginning to end. Everything felt polished from the subtle storyline giving the game a purpose to the absolutely amazing graphics. It all helps for an immersive and fun experience. Missions are varied and a challenge can be found when cranking the difficulty up. Many terrains are featured which keeps it fresh. The variety of weapons with machine guns, pistols, snipers, shotguns and rocket launchers are all quite literally a blast to use. Now something many will adore is the online multiplayer. I tried it out and was very impressed. You can play with up to 12 players across 6 maps. A ton of different modes can be played with team battle, capture the flag, zone control, bomb disposal and many many more. Perks and guns can be unlocked by purchasing them with in game money which is earned throughout the game but if your impatient you can buy game money with real money. I see my self everyday dipping in and out of the online multiplayer which means this game definitely has replay value. I think this is worth pointing out to those who like playing Modern Combat on both the iPhone and iPad but don’t like having to purchase two separate versions for each device that you will no longer have to. It’s now a universal App and we hope Gameloft continue this trend. The controls are completely customisable. You can drag the virtual buttons to wherever you desire them. You can also adjust the sensitivity of your aim which is controlled by simply swiping your finger on the right hand side of the screen. You can use the gyroscope to also aim but I end up turning it off as I couldn't be bothered. To move you tap anywhere in the left hand side of the screen and an onscreen virtual joystick appears. The controls aren't noticeable and don't interfere with the game which means there done well. Graphically this is a masterpiece for the iPhone and iPad. It looks like a console title and thats all down to Gameloft's new game engine being put into action. Everything runs with no lag and the sheer amount of detail in the environments is remarkable, reflections, shadows and lighting is all pulled off. The guns are well detailed and even the reloading is realistic. The little touches like when you move your view quickly the screen blurs slightly and bullet holes landing in walls is all appreciated. The sound effects are all helpful to bring the graphics to life. I really noticed that the voice acting was top notch in this title. The actual sound tracks and riffs ect when levelling up online or finishing a mission are as I wrote earlier very Modern Warfare. 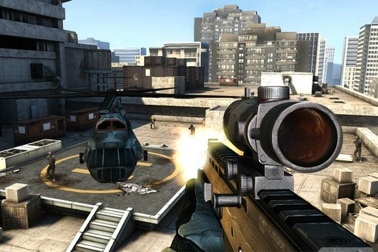 Overall this is by far the best first person shooter to hit the iPhone and iPad. Simple and not interfering controls, good plot, solid amount of weapons, a nice variety of missions alongside a fantastic campaign, great online and breath taking graphics, what isn't here?